we on way ashore to land for fridays market in Newlyn. Harvest. ETA Newlyn 11am today..Roast Pork for this mornings dinner!! Sitting down now to roast chicken dinner..Dont ask!!! These days, just like the lighthouses around our coasts these lighships are no longer manned. Instead, they are managed remotely thanks to modern technology. Weather data from the Seventones is transmitted live and can be accessed from the NOAA buoyage centre here. 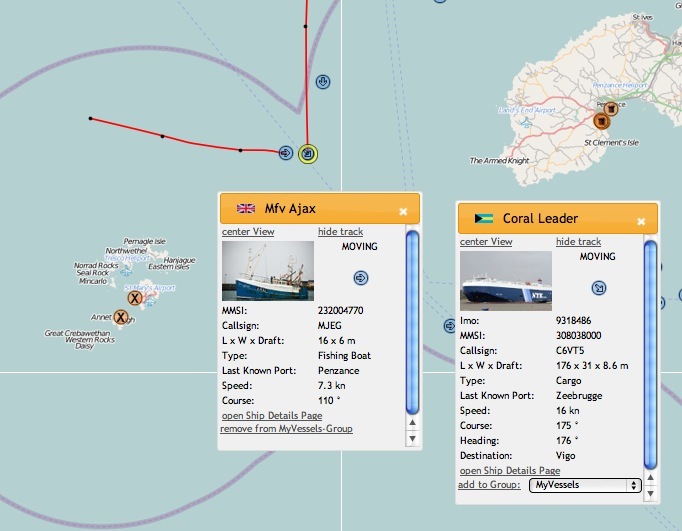 trawlers around and the same 5 Newlyn netters as last week. gear last night for 40bxs and shot them away again for tonight. As Tides are very big this weekend we won't be going to sea till monday or tuesday and try and have some #hake for next fridays market in Newlyn or Brixham... Enjoy your weekend ! Little bit of fish on the move today but lot of trouble with seals. 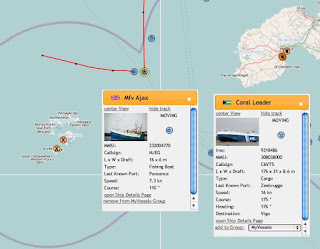 Where does that fish from the Ajax go? Now this is just the sort of message we love to see being fed back from our customers up in the smoke - nice one Rex! Been a while since I had my bonnet trimmed in Vidal Sassoons round the corner! 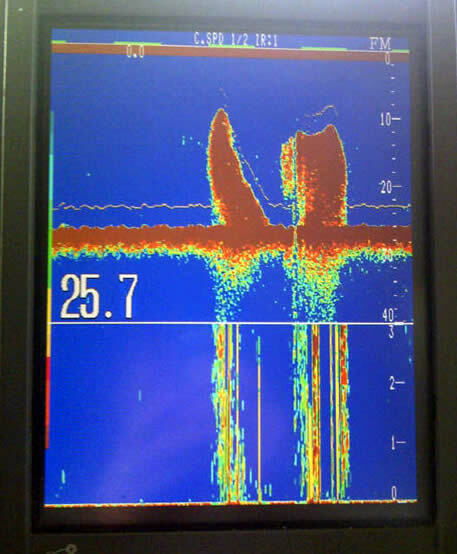 Of all the instruments available to the skipper in the wheelhouse, the electronic echo-sounder still plays a major role in the detection of fish and reading of the seabed or 'botttom'. Early models, using sound waves beamed straight down from the hull of the boat, used a roll of paper that continually moved across to display the results received by the transducer from the bottom. Today's meters display in colour on a screen - pale blue being the weakest signal return all the way through to blood red indicating something much more solid. A soft bottom like mud shows up as a thin red line with a fat orange/yellow section, a harder bottom loses the yellow and becomes a thick red as the hardness increases. In this photo taken aboard the Ajax as she steamed for Newlyn two large marks of fish - thought to be herring - can be seen. The large white number indicates the depth of the water in fathoms - for those not familiar, a fathom is six feet or 1.82 metres. That means that the shoal of fish is around 15 times a fathom high - around 90 feet - that's a lot of fish! 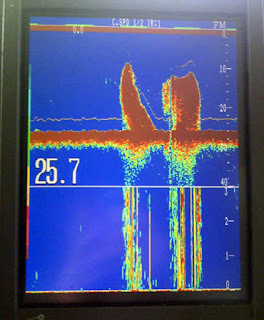 The screen is split with the lower half showing an expanded section from the bottom up to 3 fathoms - a typical working configuration for netters and trawlers wanting to interpret the water under the boat. Great British Chefs - eat hake! Wit the Ajax landing fish on Newlyn and Brixham fish markets this morning - here's a cahnce to indulge in a dish using the fish with a real hint of Spain in the ingredients - chorizo! Cannned chickpeas are OK to use too! Celebrate great British food like hake along with all the other home-grown delights that are now in season by visiting the Great British Chefs web site for more recipes and ideas from great British Chefs and restaurants. There's even an app for your mobile phone too to help keep in touch with what our top chefs and other fish fanatics are up to around the UK. The salt of the chorizo perfectly balances the earthy chickpeas and fresh coriander in this delicious fish dish from Geoffrey Smeddle. You'll need to soak your chickpeas overnight for this recipe so make sure you plan ahead - alternatively you can buy tinned, cooked chickpeas and save yourself some prep time.